" Vlora has been described by the journeymen of all times as a nymph in the shores of Ionian Sea, as a pearl of the Mediterranean coasts. Vlora, surrounded and crowned all over by Illyrian castles such as the Himara, Kanina, Borsh, and Porto-Palermo castles, by the ancient Amantia stadium, Triport, Mesaplik mosaic and Gramata’ scripture carvings carries upon its shoulders centuries filled with history. Perhaps it is not at all exaggerated to consider Vlora as a history monument. Standing in front a museum like city such as Vlora two approaches are possible: paying tribute and respect to its past and to what the city represents to the present days. How was Vlora developed? How did its history flow? Vlora is one of the most ancient cities of Albania founded in the sixth century B.C as a Greek colony named Aulona. Throughout the centuries Vlora would play a central role thanks to its strategic position in the Roman Empire, during the Norman Kingdom of Sicily and in the Byzantine Empire as well. The sea opening of Vlora would always make it attractive to consistent conquests by the Serbs, Ottomans and Venetians. Its geo-strategic charm would transform it into a fighting cause even until the recent time of Communism with Russia and China trying to control the Sazan military base in 1961. It is exactly this key position and the fighting spirit cherished by Vlora that would make it the epicenter of the Albanian world where the delegates from all over the Albanian inhabited areas gathered under the guidance of Ismail Qemali who proclaimed Vlora the first capital of the independent Albania in November 28th, 2012. We have tried to display a portrait of Vlora in the periodical edition of the Art& Heritage magazine by bring to the readers the lights and shadows of the city famous for the flag, its ancient age, the way it was built, its characteristic religious tolerance and coexistence, its surrounding histories and legends, its painting school, its musical traditions and distinguished dressing, its people and characters who made that city. 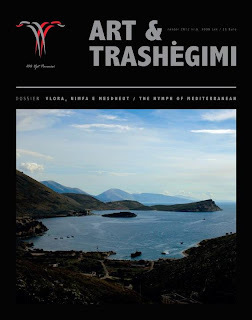 This edition presents a modest contribution in preserving Vlora’s history and values and would serve as a guide to all of them who would try to re-discover its history. " Art & Heritage is a publication of ARGJIRO in cooperation with Center of Albanological Studies. This is the 5th issue of the magazine, while the first four are dedicated to these cities respectively: Berat, Gjirokaster, Shkoder and Tirana.